A few months ago I gave a presentation on my philosophy for error handling. In the talk I introduced a small errors package designed to support the ideas presented in the talk. This post is an update to my previous blog post which reflects the changes in the errors package as I’ve put it into service in my own projects. In my April presentation I gave examples of using the Wrap function to produce an annotated error that could be unwrapped for inspection, yet mirrored the recommendations from Kernighan and Donovan’s book. Wraping an error added context to the underlying error and recorded the file and line that the error occurred. This file and line information could be retrieved via a helper function, Fprint, to give a trace of the execution path leading away from the error. More on that later. If openfile failed it would likely annotate the error it returned with open failed , and that error would also include the file and line of the openfile function. Similarly, readconfig‘s wrapped error would be annotated with read config failed as well as the file and line of the call to errors.Wrap inside the readconfig function. I briefly considered making Wrap variadic–to make the second parameter optional–before realising that rather than forcing the user to manually annotate each stack frame in the return path, I can just record the entire stack trace at the point that an error is created by the errors package. I believe that for 90% of the use cases, this natural stack trace–that is the trace collected at the point New or Errorf are called–is correct with respect to the information required to investigate the error’s cause. In the other cases, Wrap and Wrapf can be used to add context when needed. 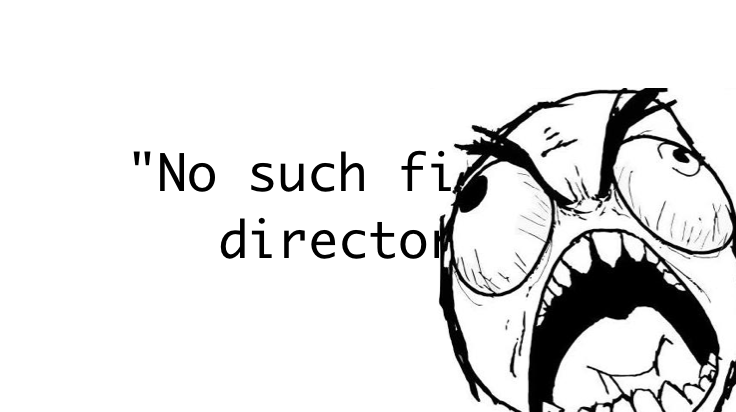 This lead to a large internal refactor of the package to collect and expose this natural stack trace. As mentioned earlier, the mechanism for printing not just the err.Error() text of an error, but also its stack trace, has also changed with feedback from early users. The first attempts were a pair of functions; Print(err error), which printed the detailed error to os.Stderr, and Fprint(w io.Writer, err error) which did the same but allowed the caller to control the destination. Neither were very popular. Print was removed in version 0.4.0 because it was just a wrapper around Fprint(os.Stderr, err) and was hard to test, harder to write an example test for, and didn’t feel like its three lines paid their way. However, with Print gone, users were unhappy that Fprint required you to pass an io.Writer, usually a bytes.Buffer, just to retrieve a string form of the error’s trace. So, Print and Fprint were the wrong API. They were too opinionated, without it being a useful opinion. Fprint has been slowly gutted over the period of 0.5, 0.6 and now has been replaced with a much more powerful facility inspired by Chris Hines’ go-stack/stack package. For those that need more control the Cause and StackTrace behaviours return values who have their own fmt.Formatter implementations. The latter is alias for a slice of Frame values which represent each frame in a call stack. Again, Frame implements several fmt.Formatter verbs that allow its output to be customised as required. With the changes to the errors package, some guidelines on how to use the package are in order. In your own code, use errors.New or errors.Errorf at the point an error occurs. If you receive an error from another function, it is often sufficient to simply return it. If you interact with a package from another repository, consider using errors.Wrap or errors.Wrapf to establish a stack trace at that point. This advice also applies when interacting with the standard library. Always return errors to their caller rather than logging them throughout your program. At the top level of your program, or worker goroutine, use %+v to print the error with sufficient detail. If you want to exclude some classes of error from printing, use errors.Cause to unwrap errors before inspecting them. The errors package, from the point of view of the four package level functions, New, Errorf, Wrap, and Wrapf, is done. Their API signatures are well tested, and now this package has been integrated into over 100 other packages, are unlikely to change at this point. The extended stack trace format, %+v, is still very new and I encourage you to try it and leave feedback via an issue. This entry was posted in Go, Programming and tagged error handling, errors, stacktrace on June 12, 2016 by Dave Cheney. This post is an extract from my presentation at the recent GoCon spring conference in Tokyo, Japan. However, I have concluded that there is no single way to handle errors. Instead, I believe Go’s error handling can be classified into the three core strategies. The first category of error handling is what I call sentinel errors. The name descends from the practice in computer programming of using a specific value to signify that no further processing is possible. So to with Go, we use specific values to signify an error. Examples include values like io.EOF or low level errors like the constants in the syscall package, like syscall.ENOENT. There are even sentinel errors that signify that an error did not occur, like go/build.NoGoError, and path/filepath.SkipDir from path/filepath.Walk. Using sentinel values is the least flexible error handling strategy, as the caller must compare the result to predeclared value using the equality operator. This presents a problem when you want to provide more context, as returning a different error would will break the equality check. Even something as well meaning as using fmt.Errorf to add some context to the error will defeat the caller’s equality test. Instead the caller will be forced to look at the output of the error‘s Error method to see if it matches a specific string. As an aside, I believe you should never inspect the output of the error.Error method. The Error method on the error interface exists for humans, not code. The contents of that string belong in a log file, or displayed on screen. You shouldn’t try to change the behaviour of your program by inspecting it. I know that sometimes this isn’t possible, and as someone pointed out on twitter, this advice doesn’t apply to writing tests. Never the less, comparing the string form of an error is, in my opinion, a code smell, and you should try to avoid it. If your public function or method returns an error of a particular value then that value must be public, and of course documented. This adds to the surface area of your API. If your API defines an interface which returns a specific error, all implementations of that interface will be restricted to returning only that error, even if they could provide a more descriptive error. We see this with io.Reader. Functions like io.Copy require a reader implementation to return exactly io.EOF to signal to the caller no more data, but that isn’t an error. By far the worst problem with sentinel error values is they create a source code dependency between two packages. As an example, to check if an error is equal to io.EOF, your code must import the io package. This specific example does not sound so bad, because it is quite common, but imagine the coupling that exists when many packages in your project export error values, which other packages in your project must import to check for specific error conditions. Having worked in a large project that toyed with this pattern, I can tell you that the spectre of bad design–in the form of an import loop–was never far from our minds. So, my advice is to avoid using sentinel error values in the code you write. There are a few cases where they are used in the standard library, but this is not a pattern that you should emulate. If someone asks you to export an error value from your package, you should politely decline and instead suggest an alternative method, such as the ones I will discuss next. Error types are the second form of Go error handling I want to discuss. An error type is a type that you create that implements the error interface. In this example, the MyError type tracks the file and line, as well as a message explaining what happened. Because MyError error is a type, callers can use type assertion to extract the extra context from the error. A big improvement of error types over error values is their ability to wrap an underlying error to provide more context. An excellent example of this is the os.PathError type which annotates the underlying error with the operation it was trying to perform, and the file it was trying to use. // and file path that caused it. So the caller can use a type assertion or type switch, error types must be made public. If your code implements an interface whose contract requires a specific error type, all implementors of that interface need to depend on the package that defines the error type. This intimate knowledge of a package’s types creates a strong coupling with the caller, making for a brittle API. While error types are better than sentinel error values, because they can capture more context about what went wrong, error types share many of the problems of error values. So again my advice is to avoid error types, or at least, avoid making them part of your public API. Now we come to the third category of error handling. In my opinion this is the most flexible error handling strategy as it requires the least coupling between your code and caller. I call this style opaque error handling, because while you know an error occurred, you don’t have the ability to see inside the error. As the caller, all you know about the result of the operation is that it worked, or it didn’t. This is all there is to opaque error handling–just return the error without assuming anything about its contents. If you adopt this position, then error handling can become significantly more useful as a debugging aid. For example, Foo‘s contract makes no guarantees about what it will return in the context of an error. The author of Foo is now free to annotate errors that pass through it with additional context without breaking its contract with the caller. In a small number of cases, this binary approach to error handling is not sufficient. For example, interactions with the world outside your process, like network activity, require that the caller investigate the nature of the error to decide if it is reasonable to retry the operation. // IsTemporary returns true if err is temporary. We can pass any error to IsTemporary to determine if the error could be retried. If the error does not implement the temporary interface; that is, it does not have a Temporary method, then then error is not temporary. If the error does implement Temporary, then perhaps the caller can retry the operation if Temporary returns true. The key here is this logic can be implemented without importing the package that defines the error or indeed knowing anything about err‘s underlying type–we’re simply interested in its behaviour. 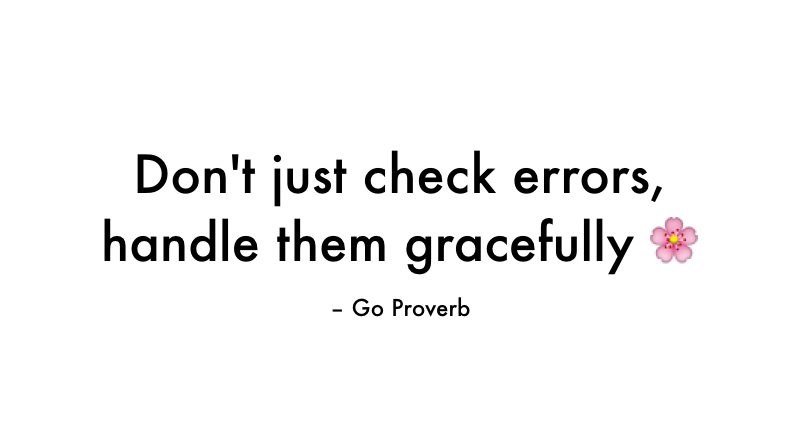 This brings me to a second Go proverb that I want to talk about; don’t just check errors, handle them gracefully. Can you suggest some problems with the following piece of code? But this is the simple stuff that everyone should be catching in code review. More fundamentally the problem with this code is I cannot tell where the original error came from. If authenticate returns an error, then AuthenticateRequest will return the error to its caller, who will probably do the same, and so on. At the top of the program the main body of the program will print the error to the screen or a log file, and all that will be printed is: No such file or directory. There is no information of file and line where the error was generated. There is no stack trace of the call stack leading up to the error. The author of this code will be forced to a long session of bisecting their code to discover which code path trigged the file not found error. But as we saw earlier, this pattern is incompatible with the use of sentinel error values or type assertions, because converting the error value to a string, merging it with another string, then converting it back to an error with fmt.Errorf breaks equality and destroys any context in the original error. // Wrap annotates cause with a message. The first function is Wrap, which takes an error, and a message and produces a new error. // Cause unwraps an annotated error. The second function is Cause, which takes an error that has possibly been wrapped, and unwraps it to recover the original error. Using these two functions, we can now annotate any error, and recover the underlying error if we need to inspect it. Consider this example of a function that reads the content of a file into memory. We’ll use this function to write a function to read a config file, then call that from main. If the ReadConfig code path fails, because we used errors.Wrap, we get a nicely annotated error in the K&D style. The first line comes from ReadConfig, the second comes from the os.Open part of ReadFile, and the remainder comes from the os package itself, which does not carry location information. Now we’ve introduced the concept of wrapping errors to produce a stack, we need to talk about the reverse, unwrapping them. This is the domain of the errors.Cause function. In operation, whenever you need to check an error matches a specific value or type, you should first recover the original error using the errors.Cause function. Lastly, I want to mention that you should only handle errors once. Handling an error means inspecting the error value, and making a decision. If you make less than one decision, you’re ignoring the error. As we see here, the error from w.Write is being discarded. But making more than one decision in response to a single error is also problematic. In this example if an error occurs during Write, a line will be written to a log file, noting the file and line that the error occurred, and the error is also returned to the caller, who possibly will log it, and return it, all the way back up to the top of the program. So you get a stack of duplicate lines in your log file, but at the top of the program you get the original error without any context. Java anyone? Using the errors package gives you the ability to add context to error values, in a way that is inspectable by both a human and a machine. In conclusion, errors are part of your package’s public API, treat them with as much care as you would any other part of your public API. For maximum flexibility I recommend that you try to treat all errors as opaque. In the situations where you cannot do that, assert errors for behaviour, not type or value. Minimise the number of sentinel error values in your program and convert errors to opaque errors by wrapping them with errors.Wrap as soon as they occur. Finally, use errors.Cause to recover the underlying error if you need to inspect it. This entry was posted in Go, Programming and tagged error handling, errors on April 27, 2016 by Dave Cheney. This is a thought experiment about sentinel error values in Go. Sentinel errors are bad, they introduce strong source and run time coupling, but are sometimes necessary. io.EOF is one of these sentinel values. Ideally a sentinel value should behave as a constant, that is it should be immutable and fungible. The first problem is io.EOF is a public variable–any code that imports the io package could change the value of io.EOF. It turns out that most of the time this isn’t a big deal, but it could be a very confusing problem to debug. The second problem is io.EOF behaves like a singleton, not a constant. Even if we follow the exact procedure used by the io package to create our own EOF value, they are not comparable. Combine these properties and you have a set of weird behaviours stemming from the fact that sentinel error values in Go, those traditionally created with errors.New or fmt.Errorf, are not constants. Before I introduce my solution, let’s recap how the error interface works in Go. Any type with an Error() string method fulfils the error interface. This includes primitive types like string, including constant strings. With that background, consider this error implementation. It looks similar to the errors.errorString implementation that powers errors.New. However unlike errors.errorString this type is a constant expression. As constants of the Error type are not variables, they are immutable. Additionally, two constant strings are always equal if their contents are equal, which means two Error values with the same contents are equal. Said another way, equal Error values are the same, in the way that the constant 1 is the same as every other constant 1. Could we change the definition of io.EOF to be a constant? It turns out that this compiles just fine and passes all the tests, but it’s probably a stretch for the Go 1 contract. However this does not prevent you from using this idiom in your own code. Although, you really shouldn’t be using sentinel errors anyway. This entry was posted in Go, Programming and tagged error handling, errors on April 7, 2016 by Dave Cheney. Revisiting my post about error handling and exceptions, written well before Go hit 1.0, I’m pleased that it stands the test of time. Java has comprehensively demonstrated that checked exceptions (actually having both checked and unchecked exceptions) has been a disaster for the evolution of the language. Checked exceptions have placed a suffocating yoke of backward compatibility on the architects trying to modernise Java’s decades old design. I can see no future language designers making the same decision, no matter how well meaning, as the Java designers in 1995. C++ exceptions, remain as difficult to use safely as they did three decades ago. When any part of your call stack can explode without warning, it is no wonder so many C++ shops mandate that exceptions not be used. Where does this leave Go, with its sometimes long winded, but always predictable error values? Error values in Go aren’t special, they are just values like any other, and so you have the entire language at your disposal. I think this is something so fundamental that it escapes the notice of most Go programmers. … exceptional code is hopelessly serial. There is only one exception in flight, how quaint is that ? There can be only one exception at any moment in flight. … [they] require immediate an exclusive attention. [The exception] comes to the fore, you must handle it right now. To me this is the argument that seals the case in the favour of errors over exceptions. Consider this simple example that consumes the contents of an io.Reader. In Go, handling any returned data, as well as an error, is second nature. I cannot begin to think of how you could handle this as simply in an exception based workflow. Returning error values is the worst form of error handling, except all the others that have been tried. This entry was posted in Go, Programming and tagged error handling, exceptions on November 4, 2014 by Dave Cheney.